With all the shopping and scurrying around going on this time of year, we decided to take a break, breathe, and take in the sights. 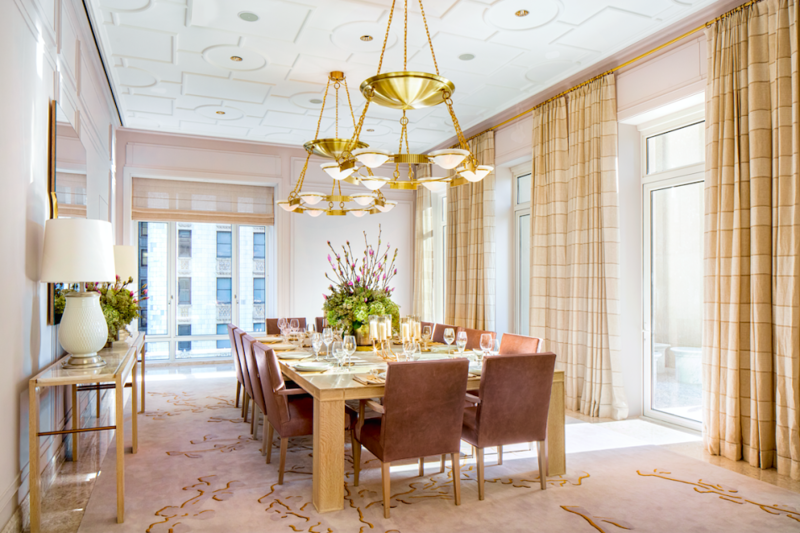 No, not another holiday window design, but rather a roundup of some of the best private dining and entertaining spaces offered in New York luxury residential buildings. While the at-home dinner party may conjure up fond memories and ignite a dash of excitement, everyone knows that actually achieving it can be a chore. Ensuring a spotless space, preparing a home-cooked meal and greeting a constant stream of guests, wine glass in hand, is the ultimate definition of multi-tasking — and a recipe for disaster. 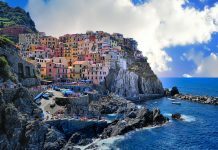 In an effort to appeal to the buyers yearning to play host(ess), developers are opting to incorporate everything from private dining rooms with ensuite catering kitchens to hotel-like services, so their residents need not lift a finger (yet still get all the credit) when throwing their holiday soirees. Check out our faves. Located in TriBeCa at the corner of Church Street and Park Place, 30 Park Place Four Seasons Private Residences is the tallest condominium tower to grace the Downtown skyline at 926 feet, with panoramic views of Midtown Manhattan, the Hudson and East Rivers, the New York Harbor, and Statue of Liberty. 30 Park Place is developed by Silverstein Properties and designed by celebrated architect Robert A.M. Stern. 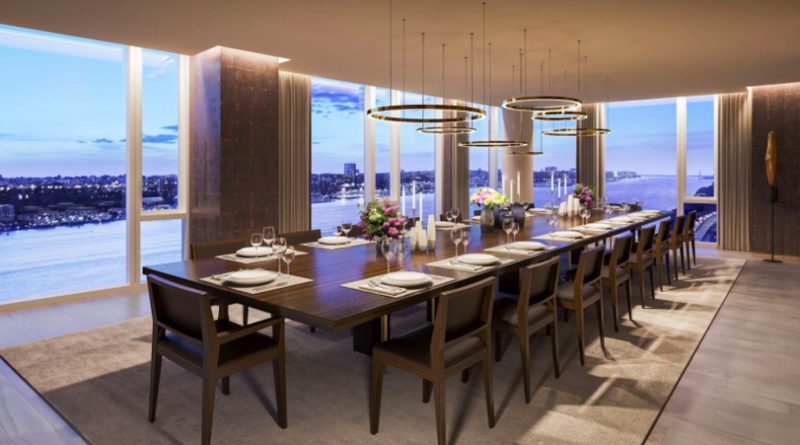 The entire 38th floor, also designed by Stern, is devoted to dedicated private residential amenities including a private dining room that residents may rent out, with a full-service chef’s catering kitchen directly attached. Additionally, a full suite of hotel services, all managed by Four Seasons Hotels and Resorts, are available to the tower’s residents. Offering the bespoke, white-glove service for which the Four Seasons is known, residents can enjoy exclusive access to the Four Seasons Director of Residences and dedicated residential concierge, who can manage the booking activities and coordinate with the hotel for the private dining room. The Four Seasons Hotel New York Downtown sits below the private residences at 30 Park Place. Occupying the first 24 floors of the tower and known for its five-star services, experiences, and amenities, The Four Seasons Hotel New York Downtown is home to CUT by Wolfgang Puck, the celebrity chef and restaurateur’s first and only New York restaurant. Anchoring the eastern corridor of Manhattan’s Billionaire’s Row, 252 East 57th Street is a 65-story ultra-luxury condominium designed by internationally recognized architectural firm SOM. 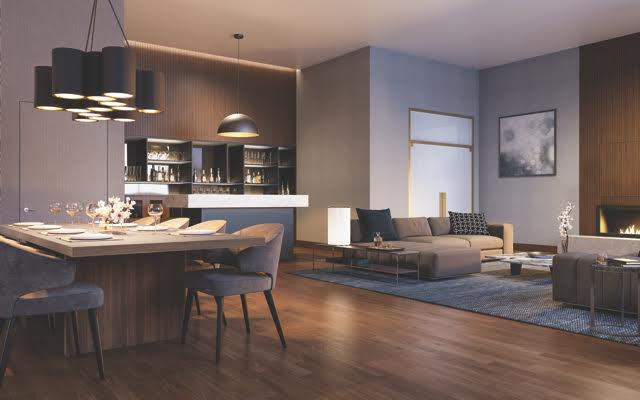 The building’s 95 condominium residences, ranging from 2- to 5-bedroom homes, begin on the 36th floor and were each custom designed by lauded AD100 interior architect Daniel Romualdez. A thoughtful collection of amenities, also designed by Romualdez, include an exclusive 34th Floor Club, that is home to a private dining room perfect for hosting holiday parties and gatherings. Residents may rent out the space for dinner parties and other events, and directly connected to it is a catering kitchen. World Wide Group and Rose Associates are co-developers of 252 East 57th Street. No penthouse? No problem. At Madison Square Park Tower, the tallest building between Midtown and Lower Manhattan, the 54th floor has been transformed into a luxurious lounge where all residents can entertain and enjoy spectacular views of the Manhattan skyline. With interiors by Martin Brudnizki Design Studio—known for its work on high-profile hotels and private clubs, including the SoHo Beach House in Miami Beach—the lounge known as FIFTY FOUR includes beautifully appointed seating and dining areas, a demonstration kitchen with the capacity for full cooking, a separate catering kitchen and a cocktail bar. 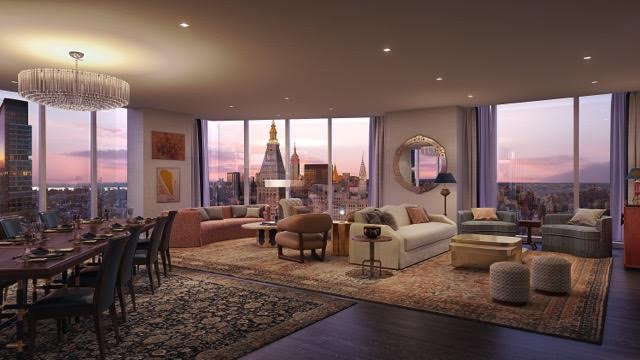 Situated in the East End enclave of the Upper East Side, 20 East End Avenue is a luxury condominium designed inside and out by the renowned Robert A.M. Stern Architects. The elegant building boasts sweeping city and river views, in addition to a variety of club-inspired amenities, including a wine cellar with a private dining room. The warmly lit space is complete with an antique dining table, slate floors, and a welcoming fireplace. A lofty, vaulted ceiling with exposed wooden beams and glass-paneled black metal French doors add to the ambiance, along with thoughtful details such as a chef’s preparation kitchen and an integrated sound system for events. A Bordeaux-style graveled pathway leads to the wine storage room, equipped with a climate control system designed to regulate temperature and humidity for optimal storage. Waterline Square has been designed by Rafael Viñoly Architects, Richard Meier & Partners Architects, and Kohn Pedersen Fox Associates to create an iconic collection of luxury residential buildings on one of the last remaining waterfront development sites on the Upper West Side of Manhattan. 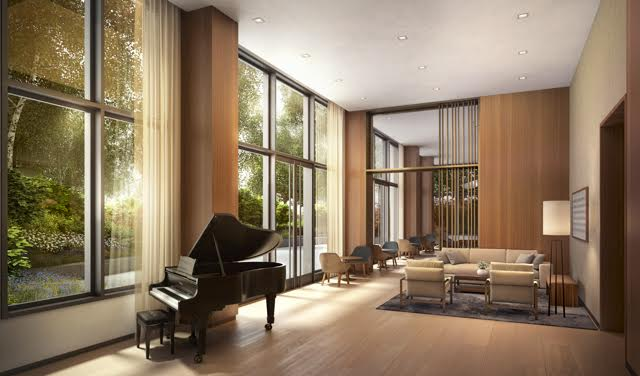 Encompassing nearly five acres, and located along the Hudson River from West 59th Street to West 61st Street where Midtown meets the Upper West Side, the three buildings have beautiful interiors designed by Champalimaud Design, Yabu Pushelberg and Groves & Co. The towers boast over 100,000 feet of best-in-class sports, leisure, and lifestyle amenities, as well as condo amenities specific to each including private dining rooms with a catering kitchen nearby. The large spaces encompass both living and dining areas, with plenty of room for seating and entertaining guests, as well as mingling and moving about the two freely. Large windows in each of the three private dining rooms throughout the development offer an abundance of natural light and sweeping views of the Hudson River and Manhattan skyline that stretch down to the Statue of Liberty. 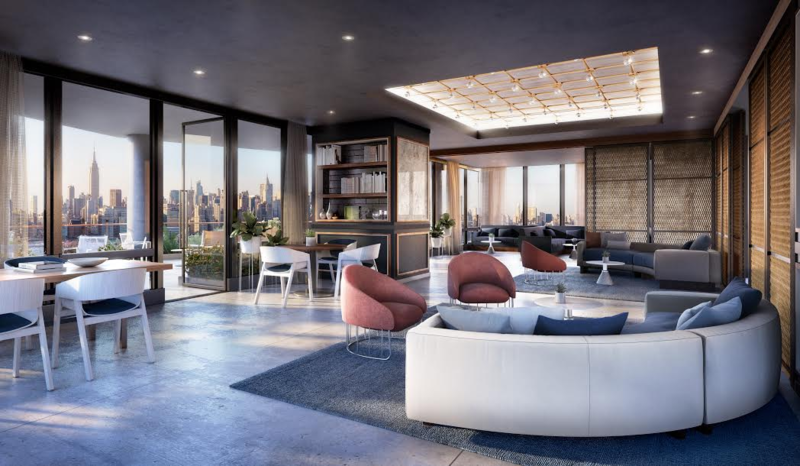 Nestled among Brooklyn’s most desirable neighborhoods, near the borough’s largest transportation hub, 550 Vanderbilt is a newly opened unique full-service condominium offering a modern lifestyle within a park. The building boasts over 10,000 square feet of amenity spaces that have been designed for socializing, wellness and entertaining and that include a private dining room located within the residents’ lounge. An expansive space, the lounge encompasses both living and dining areas, the latter of which can be sectioned off for private dinner parties, or left open for guests to flow freely from one space to the next. Large windows offer an abundance of natural light and stunning views of the courtyard and Pacific Park. To ensure a seamless flow, a fully outfitted catering kitchen equipped with the finest appliances and finishes is also easily accessible from within the lounge and dining area. Continuing the evolution of the North Brooklyn waterfront into one of New York City’s most scenic and desired residential areas is The Greenpoint, the first-ever skyscraper in Greenpoint along the East River. Nestled along the neighborhood’s popular East River Ferry pier and a new public waterfront park to be built by The Greenpoint’s developers — Mack Real Estate Group and Palin Enterprises, in conjunction with Urban Development Partners — The Greenpoint signifies the neighborhood’s tallest building at 40 stories, and features a collection of 95 studio to three bedroom residences. With over 30,000 square feet of indoor and outdoor amenity and lifestyle package unprecedented for the neighborhood, one of the standout amenities is a private dining room and catering kitchen. Families and friends alike can gather in this large thoughtfully designed, open space by K&Co., perfect for large holiday soirees or the most intimate gatherings. Located along New Jersey’s sought-after Hudson River waterfront in Jersey City’s idyllic Newport neighborhood, is luxury condominium development Park and Shore. 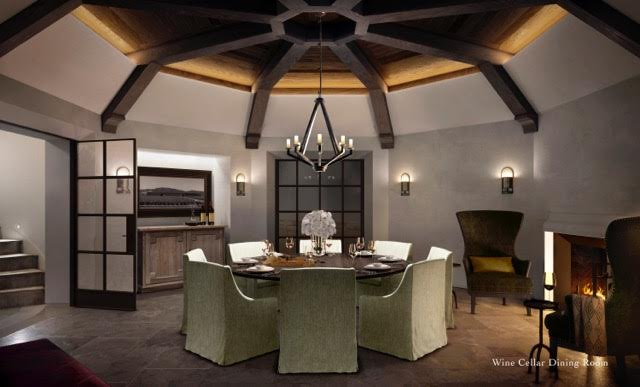 One of the development’s most exciting spaces is the wine tasting lounge with private dining room. Not only does it provide an elegantly designed space for larger gatherings, but also eliminates the added stress of ensuring a spotless home before the guests arrive. Ideal for the holiday season, cocktail hour can begin in the tasting lounge before everyone transitions to the dining room for an extravagant meal. There is no better way to throw a holiday soiree!